We’ve all heard it said many times before, “all kids are different”. And that is true. This is why we’ve designed a number of different assessment packages to cater for the different needs of children that we see here at Kids Chatter. So rather than a “one size fits all” approach, we offer assessments based on what your child actually needs and you will know up front what to expect in terms of your time and financial commitments. Listed below are the 8 different assessment packages we offer and what each includes. They are divided into Preschool Aged children and School Aged children to make it a little easier to find things based on age, but it will depend on the areas of concern as to which assessments will be required. When you contact us for an appointment, we’ll ask you a number of questions to work out which assessments will be the most appropriate for your child’s needs. Because of the varying types of assessments that we offer, there will be differences in terms of how long some assessments take or how involved they are. This is why some assessments will only take 1 hour whereas others may take up to 3 hours. Rest assured, we only do 1 hour, at most, in one session because we know that children get tired and lose concentration. For each assessment done, a written report is included as part of the fee. Some of you may ask, “why do we need a written report?”. 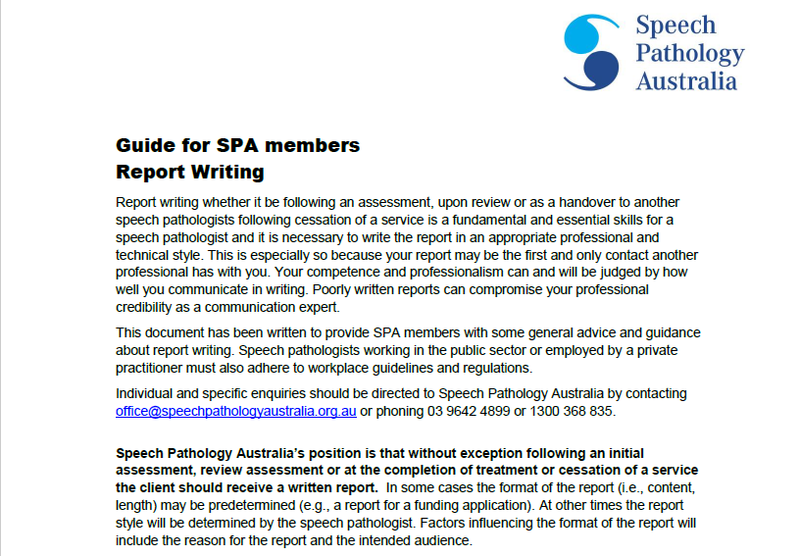 Not only is it regulation according to Speech Pathology Australia to have written documentation of all assessments and results completed, but we believe that it is also a vital process in the way that we help your child. Research shows that on average, people only retain about 5% of the verbal information provided by a health professional to a patient/client in a healthcare setting. So to avoid vital information being forgotten, especially when there can be multiple areas that we’ve explained to you, we write it in a detailed report for you. Also, many teachers, GPs, Paediatricians and other professionals that you may be seeing, will always ask for a report. If your child is starting school, they often request written information about your child’s results as well. 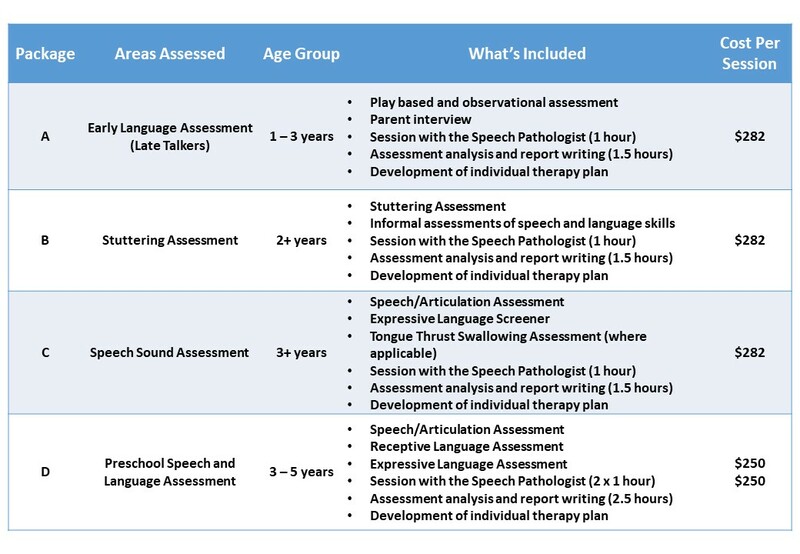 And lastly, if you ever need to see another Speech Pathologist, they can use this written information to continue working with your child and/or avoid them redoing the exact same assessments that you’ve already paid for. If your child has previously been assessed by another Speech Pathologist before coming to see us, an assessment may not need to be redone. This will depend on how long ago those assessments were done and whether or not there is a written report with details that we can use. Please contact us to discuss your options. No one likes unexpected costs or needing to book extra appointments that you didn’t know you needed. So, with that in mind, we have listed all our fees in the tables below. 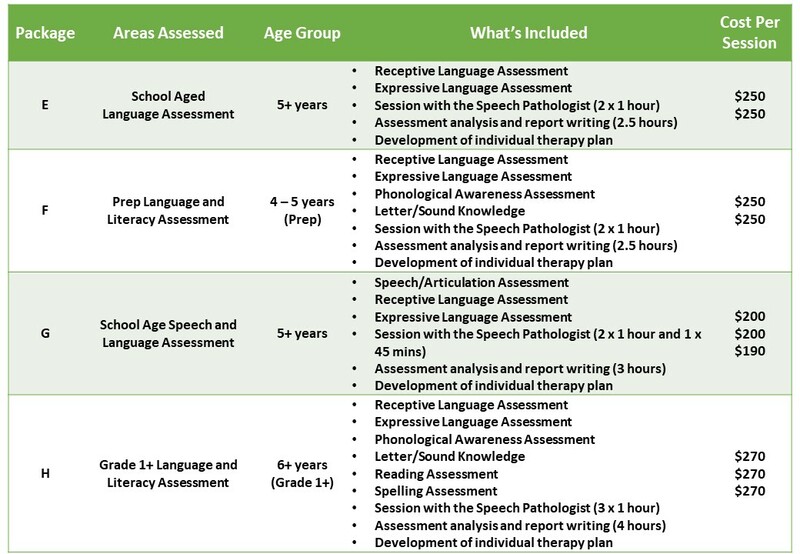 The fees for all of our assessment packages include the face-to-face time with the Speech Pathologist and it includes a comprehensive written report so there are no additional charges for this (reports can take up to 3 – 4 weeks to write, depending on the complexity of the assessments). If you have any questions about any of the packages or how it all works, please don’t hesitate to contact us and we will explain how it works based on your child’s needs. What else is included in your fee?